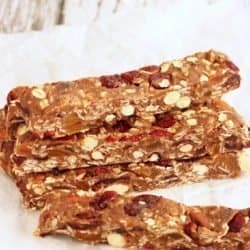 Customize these Fruit and Nut Energy Bars with any fruits or nuts you like. They’re quick and easy to make, and require absolutely no baking. Guys – do you ever buy “energy bars” (you know, the type that are kind of expensive and are supposed to be eaten on top of a mountain, or at the end of a long bike race), but then you just end up eating them when you really want cookies, because they make you feel a little less guilty? Yeah, me too. There are two major problems with those fancy energy bars. The first, is that there are so many delicious flavors, I end up buying one of each. Which brings me to the second problem, which is the price. Yikes. If I only ate them when I made it to the top of a mountain, that would be one thing… Really expensive cookie habit. That’s why I had to start making my own, and they are so ridiculously easy to make – you should too. Making your own energy bars allows you to be creative with the flavors and ingredients – how about apricot, almonds and vanilla? Or macadamia nuts, coconut, and pineapple? Or peanut butter, walnuts and chocolate chips? The possibilities are quite endless, and it’s really nice to keep a stash of these in your freezer for when you really do need a quick and healthy snack when you’re hiking, biking or working out. Or for when you just need cookies, but prefer a healthier option. 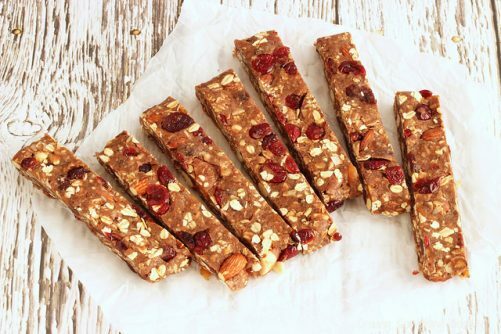 Here’s another great reason to make your own energy bars: portion control. As in – my favorite brand that is available in the grocery store is way too small. I prefer to eat one and a half. So mine are cut just a little bit bigger. But you decide how big to make yours. Heat a saute pan over medium high heat, and toast the oats and almonds for about 3-4 minutes, or just until the nuts are fragrant and the oats start to look toasty. Remove from heat and let cool. In the bowl of a food processor fitted with the chopping blade, combine the dates and peanut butter. Process the mixture until the dates are smooth. Add the protein powder and pulse again until everything is smooth and a dough forms. Place the toasted oats and nuts into the food processor and pulse just about 5-6 times to combine the oats and nuts into the dough. Transfer the dough to a large mixing bowl, and add the cherries, cranberries, coconut, and apricots. Stir with a spatula, or mix with your hands. If the mixture is too moist, add additional oats or protein powder. If is it too dry, add a few drops of water. The dough should be sticky, but stiff enough to roll out. Transfer the dough to a parchment paper or Silpat lined baking sheet, and roll or shape it into a long rectangle, about 1-inch thick, and as wide as you would like your bars (I like my bars about 4-inches tall). Chill the dough in the refrigerator for an hour, and then slice into bars. Wrap each bar in plastic wrap, and store them in a freezer bag in the freezer for up to 2 months. If your dates are on the dry side, soak them in about 1 cup of water for about 20 minutes before processing. 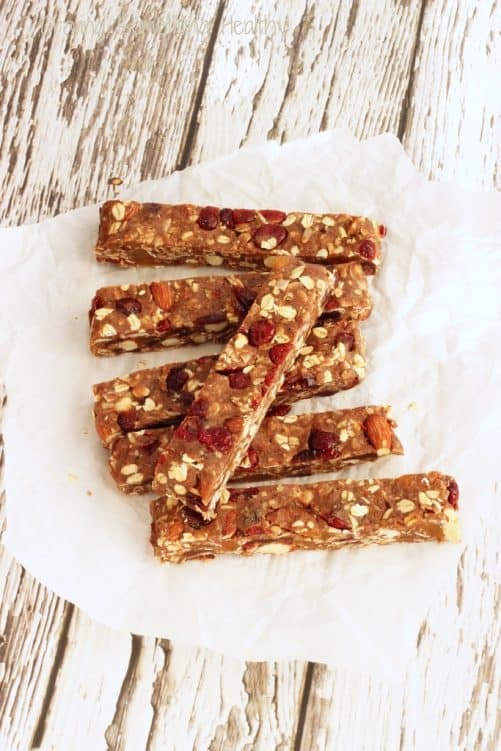 When do you snack on energy bars? These looks super simple and filling! Love the addition of some protein powder for some extra staying power too! Love this! This looks so good. Hi Rose, If you cut this into 14 bars, each one should be 223 calories, 16 grams carb, 7 grams protein and 15 grams fat (from the coconut). If you skip the coconut you’ll cut down the calories under 200 calories each. Thanks for visiting!